In my last article I made it clear that ZANU-PF was headed for a collision course in the bid to succeed Robert Mugabe. There was nothing prophetic about that really, because all indicators were pointing to it. But what I didn’t see was the Grace Mugabe phenomenon. One Dinizulu Mbikokayise Macaphulana did, in his article published elsewhere. I was intrigued that he did. But as I checked for this person’s digital footprints, I was left unimpressed. His existence is very much questionable. For a published academic, journalist turned political scientist, with insightful analysis on Zimbabwe, we would expect a solid digital footprint. I even failed to find a photograph of him. Grace Mugabe has brought in a new dimension to the power politics of ZANU-PF. Her supersonic ascension to a commanding position in the factional succession politics was incredible. It was well calculated. It started with a Muchinguri backed nomination for Secretary of Women’s League. Then a dubious PhD awarded by the University of Zimbabwe. This was succeeded by a series of meetings and rallies across the country that filled public discourse for the last 3 weeks. In the process, she confirmed all the rumours of a ZANU-PF divided along Mujuru/Mnangagwa lines. She showed lack of tact or strategy and was rather reckless in dealing with factionalism in ZANU-PF, leaving a more divided party than she found it. It is quite clear she has chosen a side, and in the process, proliferating the very same factionalism she purports to be fighting. Gallivanting nationwide to discredit the name of Joice Mujuru showed Grace Mugabe to be a woman of weak character and reckless conduct. The timing of Grace Mugabe’s escapades is very much telling. It is signalling the end of Robert Mugabe’s reign. He is turning 91 soon, and cannot cope with the demands of being a President of a struggling country, and leader of a warring party. Most likely, he will not finish his term by 2018, and if this happens Joice Mujuru will automatically become the President according to the new constitution, a precedent Grace Mugabe cannot accommodate together with her faction. Therefore, the only realistic chances of the Mnangagwa faction gaining ground in the succession race, is to deal with Mujuru at the coming congress, and possibly install a new Vice President who will eventually succeed Mugabe. The Mnangagwa faction has been fighting with their best tool at hand, the media. Jonathan Moyo has availed all the radio stations, newspapers and ZTV to advance their cause, giving unbelievable deification of Grace Mugabe. Joice Mujuru has suddenly become a public enemy, a corrupt and incompetent leader. 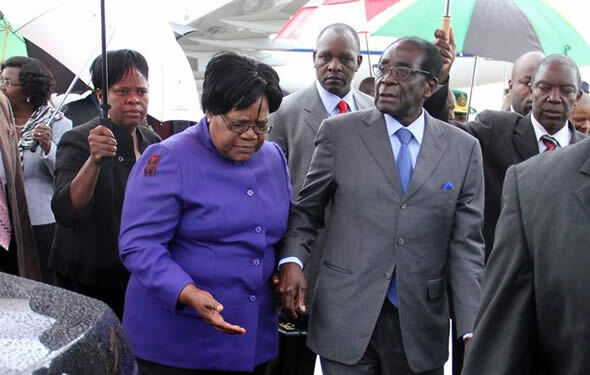 Fantastic allegations such as working with USA to overthrow Robert Mugabe have been levelled against the person of Joice Mujuru, to ridiculous not-so-newsworthy allegations that Joice doesn’t visit Grace at Mazowe Estates, featured here and there. Wordsmiths have been thriving at Herald House recently. Tens of articles are released everyday portraying the First Lady demi-god like. I was also interested in Patrick Zhuwao’s Sunday Mail articles. They were, in a way synchronized with the drama that the First Lady performed, suggestive that it could have been a coordinated effort. From Mugabe’s nephew I honestly expected more inspiring and detailed articles that would stimulate a somehow intellectual approach to this whole issue. It was the same wordsmithing and politicking that we expect from apprentices like Psychology Maziwisa. It went beyond that. For example in the Sunday Mail of 27 October 2014 he wrote, “Such a diagnoses requires that epistemological approach transcends interpretivism and is influenced by a criticalistic epistemological approach that boarders on the feministic epistemology in search of truth and knowledge”. I honestly wonder how the Editor of Zimbabwe’s biggest weekly missed that meaningless statement. The statement does not mean anything at all. Then there is Nathaniel Manheru, George Charamba’s alias. He is my favourite of columnists at The Herald. His take on the whole issue of factionalism was cautious, and rather chose to attack journalists. His attack could have been more credible if it was fair and balanced. He chose to attack independent media’s coverage of Grace Mugabe’s escapades, giving a shocking blind eye of the journalists at Herald House. Is ZANU-PF going to split? It is very clear that demands of a Mujuru resignation from Grace Mugabe are very dangerous. Mujuru commands a huge following, especially from the youth, progressives, centrists and fellow former war fighters within the party. Joice Mujuru is either going to stay or the party splits. I don’t think Grace can even summon enough Politburo votes to push Mujuru out. The allegations of corruption are not even good enough. What is ironical about these corruption allegations is that they are coming from within ZANU-PF. This reminds me of that Biblical story of a woman who was about to be stoned for prostitution. Jesus in a somehow satirical manner said, “He who has not sinned may cast the first stone”, much to the embarrassment of the crowds. I will only take corruption allegations seriously when they are coming from someone else. But this is not a defence to Joice Mujuru, and the alleged corruption case. She has a case to answer. Actually, it is in her interest to answer these allegations and declare her properties and wealth, and account for them. What will happen if Mujuru wins? Joice Mujuru has proved that her show of maturity, composure and wisdom might be her ticket to presidency. She is equipped with the experience, knowledge and tactfulness that befit a President. She commands the respect and authority from her peers and seniors who fought alongside during the Liberation struggle and who served with her in government. 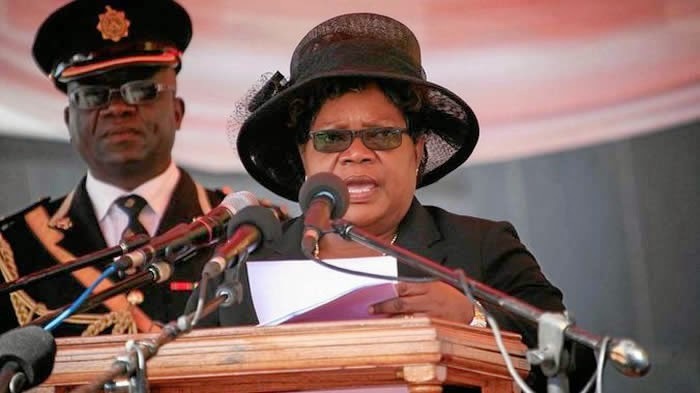 Always with a modest hairstyle, Amai Mujuru has managed to remain humble despite her achievements and wealth, and maintains a connection with her followers who relate to her struggles as a woman, mother, and a role model. She became the first female and youngest ever Government Minister, with little educational background and experience. But like most back then, she would go to night school to study for High school qualifications. She read for a Bachelor’s, and Master’s and eventually her coveted PhD, something that inspires many men and women around the world. There is a human face to the huge character of Joice TR Mujuru. If she wins, she will most likely restore the confidence in leadership. Zimbabweans everywhere are worried about the economy. They want less politics, and more economics. This requires a person whom the international community can have confidence in and this will boost investor confidence, and increase our trade market. Zimbabwe will definitely be poised for an economic comeback, if Joice Mujuru succeeds Mugabe. Her win will affect the party, negatively as well, definitely. The task of reuniting the party is insurmountable. Her sworn enemies are most likely not going to back down, and this power struggle might continue for a while, even after Mugabe’s departure. What will happen if Mnangagwa wins? Emerson Mnangagwa is said to be a very practical man. He is very shrewd, quiet, careful, and most information about him is unknown to the public. He once said that he is “as soft as wool”. He is also said to be one of the most feared ZANU-PF leaders with good relations with the military and other government enforcing arms. He has attempted to become the Vice President of ZANU-PF before, with the majority of endorsements, only to lose out to Joice Mujuru on 18 November 2004 in a Politburo meeting. The insistence of Emerson Mnangagwa on a secret ballot during the Vice Presidency post in the December 2014 ZANU-PF elections, might be an indication that he is confident of winning, via that route. I don’t know if he is still as popular as he was, 10 years ago. It is also said that the disbandment of DCCs worked against him. Mnangagwa’s lack of appeal and charisma to the ordinary people is worrisome. It is still difficult to ascertain if he can conduct a rally and articulate a message that can restore confidence in the people. Robert Mugabe set the bar too high for his successors when it comes to articulation and oratory skills. His image in the international media as a heavy handed man is something that he will need to work on if he has presidential ambitions. These will not only work against him, but will work against Zimbabwe as a whole. How has the economy suffered from this nonsense? The struggling economy is the biggest loser from this political drama. Grace Mugabe has single-handedly created an environment of political uncertainty, which is a huge turn-off to investors. This situation created by Grace Mugabe does not inspire confidence at all, in the ruling party and its systems and processes. Government Ministers spent 2 weeks trailing Grace Mugabe to her rallies, and it makes us wonder if they made time to do government business. All the effort, ideas, attention and energy which should channelled to the recovery of Zimbabwe’s economy is being used to bring other people down, fight for positions in a post-Mugabe ZANU-PF. We don’t know how far this factional politics will go. And people are already preparing for another 2008, by divesting in the economy, externalising funds or withdrawing funds from bank accounts. There is high uncertainty. If some economist could quantify the losses made from this drama, they are the excess of hundreds of million. The drama is going to drag on for longer than most expect. Our opposition parties are still to recover from the shock defeating in the 2013 elections. They are failing to restructure and remobilise quick enough to become relevant in the next elections in 2018. The so-called shadow government by Morgan Tsvangirai is just a list on a piece of paper in his office. Some might think MDC is the beneficiary of the ZANU-PF infighting. Actually, this is yet another lost opportunity for the embattled party or parties, more accurately. MDC is going to lose the 2018 elections yet again, whether Morgan Tsvangirai stands, or a coalition is formed. Will a new ZANU-PF give rise to a new Zimbabwe? One thing that I have learnt from the recent political crisis in Zimbabwe is that, there are no guarantees that the resignation of Robert Mugabe will bring prospects of a better for Zimbabwe as an economy. To choose between Joice Mujuru and Emerson Mnangagwa is a gamble, and we might win or lose. The best way of looking at Joice Mujuru and Emerson Mnangagwa is by looking at the people in their inner circle. Who is likely going to advise them? Are those people motivated by the greed, power and control or genuine desire to develop Zimbabwe? Are the people technically competent? What is their age group? Who has the largest youth following? Most ZANU-PF members are sitting on the fence. Not because they are not interested in factional politics, but are just opportunists waiting for the right and necessary signs to assess the one most likely to prevail. The biggest risk of this factional ZANU politics is that you will either win big or lose big. Sitting on the fence is the only way that guarantees one does not lose big. Zimbabwe is now a joke. ZANU-PF should get its act together at the Congress and make sure we don’t slide back to 2008.